Spring is upon us, and the land is greening up. It’s time to get outside and wake up your landscape. A yard that is picture perfect is a salve to the soul. Here are some tips to make your yard stand out and increase your curb appeal ten-fold. What is your front yard saying to neighbors and passers-by? Does it say “Come on in,” or does it say, “Keep out?” The front yard is the first thing people see when approaching your home and it sets the tone for the entire visit. Make your yard a showcase; a few small projects can make a bold statement. First consider your location, be it in the country or in the city, and tailor your landscape accordingly. There are no hard and fast rules and if you desire to reflect something other than the yards around you, do to suit yourselves. If your house is close to the road or well-traveled sidewalks, such as in an urban setting, you will most likely want at least a portion of the yard to be a private space. The best way to do this is to close off a section in whatever size you desire with some type of wall. You can use whatever you desire to create this wall. You can choose a fence or lattice, or, for a softer divider, choose shrubs or trees, such as a fast growing Leyland Cypress, spaced close together for privacy and far enough apart to allow proper space to grow. One advantage to living privacy fences is the fact that, most of the time, there is no special permit or restrictions on these structures. Adding a flagstone edging to flower beds is very visually pleasing. Unlike plastic or other “man-made” edging, stone is a natural element that is warm and inviting and increases your home’s value. Simple stone edging requires only sand, gravel, and the stones themselves. Check to see what the guideline is for these types of projects to ensure that you do not need a permit. If you prefer a different look consider rigid edging. Edging is appealing for the way it defines the transition from beds to lawn. Avoid flexible plastic edging for the fact that it looks cheap and will have to be replaced sooner than other, better products. A walkway to and from the main entrance to your home adds a pleasing visual statement. Lay out a path to your home’s main entrance. If you normally enter at a side or back door, lay the path there instead of to the front door. Paths can be straight or curved depending on the look you are going for. Flagstone paths are a natural element and give a more casual look, whereas brick is more formal. Many houses have an existing concrete walkway, but this can easily be removed. Grass is a big part of your landscape; in fact, it is the foundation from which all other elements will grow, creating a cohesive design. Some lawns are easy to grow and maintain while others resist all efforts to remove weeds and strengthen the lawn. Zoysia grass is a good choice for its carpet-like thickness and interwoven roots that block weeds from growing. The downside to Zoysia is it is very brown during the winter and, some will say, you have to kill all other grass for Zoysia to grow, but that is not true. Zoysia, albeit at a slow pace, will spread on its own and take over the entire yard. To speed spreading, take plugs from the existing Zoysia and plant where you want it to go. 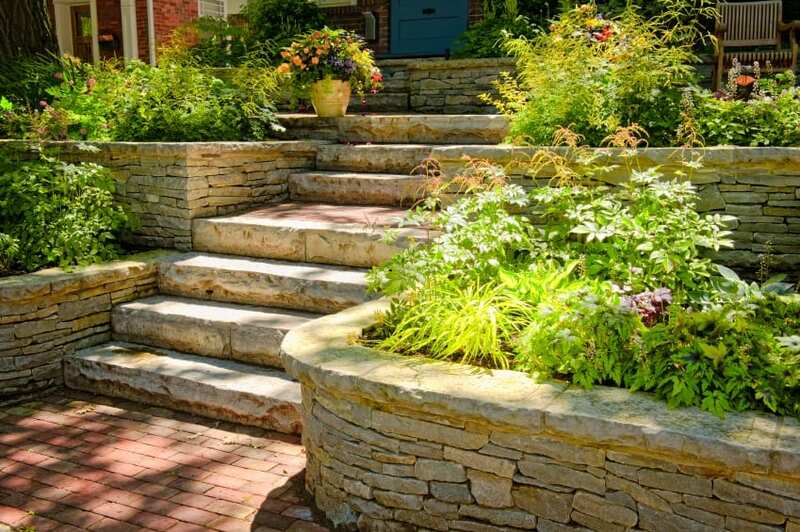 Landscaping is a great way to make your outdoor space as livable as your indoor space and looking at a pleasing landscape will lift your mood and put a smile on your face as you admire the work of your hands.